The year is 3092. Robots have taken over the human race. Humans are still around as long as they're useful to the robots. 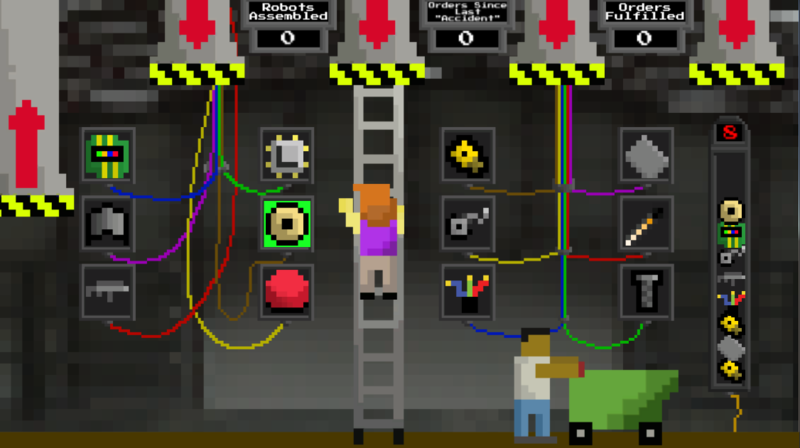 You play as two workers in a robot manufacturing plant. Maintain efficiency in order to build the most robots and please your robot overlords! Play by yourself for a challenge or team up with a friend! • Items will queue up on the right side of the screen. • Use the Climber to push the corresponding button to drop the item out of a pneumatic tube. • Use the runner to catch the item in the cart. • Bring the cart to the pneumatic tube at the left side of the screen. • Throw the item in the tube. • You can carry as many items in your cart as you want, but having over 3 will begin to slow the runner down. • Items can bounce off of the Climber's head, but they will daze the Runner. • Items that hit the ground or the Runner's head will count as an accident and reset your efficiency multiplier. Play the game in fullscreen mode!